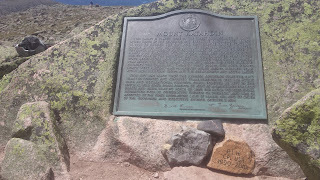 On Saturday, June 27th I took part in a non-hosted hike of Mt. Katahdin. 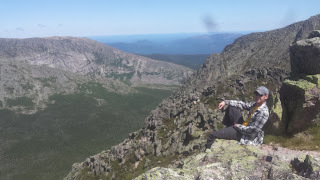 I am ashamed to admit that even though I have spent the majority of my life in Maine and grew up in it’s shadow – I had never hiked the mountain. I had always preferred sticking to the northern part of Baxter State Park where there were less people. Heading into the woods for me is about the opportunity for reflection that comes with getting away from all of the distractions – people, technology, everyday life… The southern part of Baxter State Park is amazing in it’s own right with rugged country and breath-taking views – but it also draws more hike/tourists and so it held a little less appeal for me.I had always thought “Someday I will hike the mountain” but it was never a pressing need for me. And then along came The Summit Project. 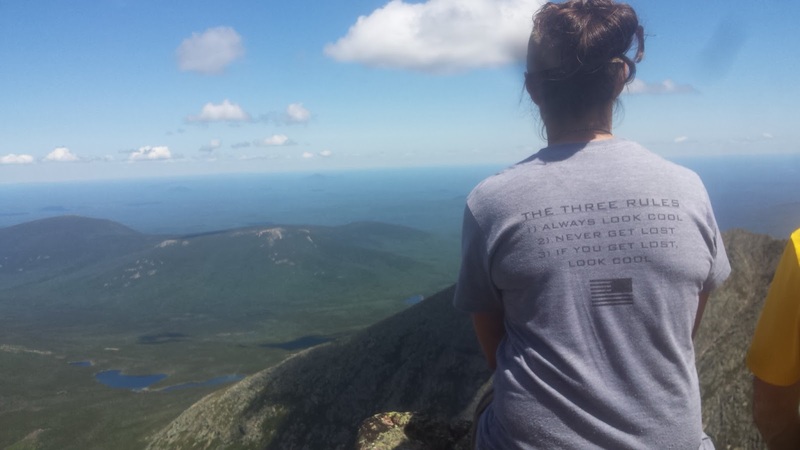 The Summit Project has a goal to do a hosted event Memorial Day Weekend where hikers will carry stones representing fallen soldiers from Maine up to the top of Katahdin. One of these stones represents SPC Dustin J Harris of Patten, ME. It’s Dustin that brought me to TSP, and it’s TSP that brought me to the mountain even though Old Man Winter has not cooperated to give TSP the opportunity to summit Katahdin during the Memorial Day Weekend event.The idea for Saturday’s hike came from Baxter State Park Ranger Mike Winslow. He was responsible for giving the hiker brief at Twin Pines during the Memorial Day Weekend. A simple question of “Have you ever seen all of the stones together in one place?”, and within minutes he was hooked. This sparked conversation of assisting with stone transport for him to hike one on Katahdin, which in turn grew into a five person/trip that I was fortunate enough to be a part of. The weekend started right where the idea for the hike started – at Twin Pines. As I looked around the table at our crew – Cathy, Jack, Dylan, Mike, and me – I was again blown away at the impact that TSP is having not just on Gold Star Families, but also on the people that become a part of the larger TSP family. As we shared a meal, we shared stories, laughter… life. I don’t think that will ever cease to amaze me. We were spending Friday night at a group campsite at Foster Field in Baxter State Park. We had grand plans of having a campfire and making s’mores, but we had gotten so carried away chatting at Twin Pines that we did little more than crash there for the night. Saturday started with an early morning wake-up. I think we were on the road for Roaring Brook by 6am. 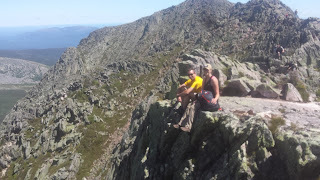 Mike acted as the Team Lead (TL) on this hike, and he had planned a day that would take us up Helon Taylor to Pamola Peak, across Knife’s Edge to Baxter Peak, and then down Saddle Trail to Chimney Pond and on to Roaring Brook. This would not only check off “Hike Mt. 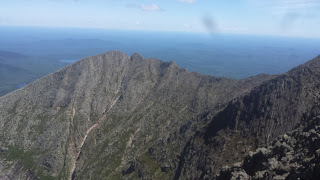 Katahdin” on my bucket list, but also check off “Hike Knife’s Edge” on Dylan’s. What an added bonus to the day! Gathering our team together at Roaring Brook, Cathy and Jack opted for a hike of South Brother rather than Katahdin due to unforseen circumstances. They had an amazing hike honoring the lives of SPC Thomas J. Dostie and SO1 Patrick D. Feeks, and they would meet us at the end of our hike. Dylan, Mike, and I continued with plans to hike up Katahdin. From the beginning, I knew that this was going to be tough….as we progressed up Helon Taylor, I realized just how tough. I was hiking that day with the stone of CPL Andrew L. Hutchins. Dylan Harris carried PFC Blaine Adams. Mike carried CPT Jay Brainard. In the weeks leading up to the hike, I had learned many things about Andrew from his father and step-mother, Jeff and Betsy Hutchins. I had been looking forward to carrying Andrew on a hike for quite some time, and so when the opportunity presented itself – I stepped right up. I thought of them and the stories they told me as I hiked that day. From all that I have heard, Andrew was a go-getter. He was the type of person that was always going to do more than what was asked of him. Assign him a training task to carry 40lbs in his ruck, and Jeff would visit only to find him carrying 70lbs. That is just the type of person that he was. Jeff has said many times that were Andrew able, he would be right there hiking along side us as part of The Summit Project. I felt him there with us as we went up Katahdin. Normally I feel tough and strong as a hiker, but whether the reality check was due to plaguing injuries or physical fitness – the hike was tough. It was also tough not to get distracted by the views once we were above tree line. Thankfully Mike and Dylan were nothing but patient as I stopped to take photos or stretch my legs. I kept looking up at the rest of the climb thinking “What did I get myself into?” with a mix of excitement and dread for the rest of the journey ahead. But with every step the stone settled into my pack and shifted into place like it belonged there. The physical weight I carried seemed to lessen as I focused more on the story that I carried. I’d see a view and think of sitting at camp looking out across the mountains with Betsy. I’d hear a fishing story from Mike and think of Jeff and where the stone had come from. I’d watch Dylan hiking and think of Andrew’s brother, Ben. It all helped to push me up that mountain. The first peak we came to was Pamola. I think Mike planned that for the dramatic effect of reaching the peak – the view across the mountain is hidden right up until you get to the top – then it is just amazing in it’s breathtaking beauty. It’s like someone pulled a curtain up and all of a sudden, there it is. My face still hurts from the smile it gave me. Dylan Harris – Knife’s Edge Trail in the background. Photo taken by Dylan Harris. Dylan overcoming his fear of heights. When we reached Baxter Peak, I remember looking back across Knife’s Edge and thinking “Wow – we crossed all of that?” Even though many have done it before and many will continue to do it – it was still such a feeling of accomplishment. And it meant all the more to have been carrying Andrew’s stone. Baxter Peak was pretty crowded that day. Weather is unpredictable in Maine, and we happened to have a perfect day for Katahdin, so many were taking advantage of it. We decided to find a spot to take a rest and some photos before taking the next step in our TSP journey – the Circle Ceremony. We found a quiet ledge just down from the peak and settled in for a bit. Stones of CPT Jay Brainard, CPL Andrew Hutchins, and PFC Blaine Adams. Once the peak had cleared out a little, we approached the cairn at the summit. This cairn is no small pile of rocks – I swear it is as big as a Christmas tree, and who can blame the hikers for creating it? Reaching Baxter Peak is definitely worth celebrating. With the help of a few other hikers, we got some quick photos in before finding a more quiet space to have our ceremony. Our ceremony was done just a short way down the trail. Unlike most of the ceremonies I have been a part of, this one was very short since we had only three hikers. Dylan spoke of Blaine Adams’s devotion to family and how he always showed up unexpected to spend time with his mother and help her out. Mike spoke of Jay Brainard’s love for Maine and ties to Katahdin and how many things made him feel connected to Jay in his story. I spoke of Andrew’s determination to do more than what was required, the love he had for his family, and the pride you can hear in Jeff’s voice every time he shares Andrew’s story. “Pride is no sin. Always have pride.” – A quote from Jeff that has stuck with me ever since hearing it, and I shared it with Dylan and Mike. We shared a silent moment there with each other before placing the stones back in our packs for the hike back down. I always find that the hike up the mountain is full of sharing stories and bonding as a hiking team. We bond through our mission and shared sense of purpose. And then once the mission is complete, we all fall into a quiet reflection on what we have just done and the lives we have honored in doing so. This hike was no different, and even though it was a relatively quiet hike down the mountain – my mind was racing through all of the things that I would write about when sharing this experience with the Hutchins family. After a brief stopover at Chimney Pond to rest our legs, we finished our hike back where we began at Roaring Brook. Cathy and Jack were there waiting for us – Cathy with her trademark smile and a hug for us all. We were all exhausted from the day, but we were also smiling ear to ear. I have never known a closer family than this TSP family, and it seems that with every hike we grow a little more in number. After a group photo, we all said our goodbyes – off to rest and recover before returning to our daily lives. But each of us left with the solid knowledge that we had found a little more room in our hearts than we thought was there and our family had just grown more because of it. I want to say a special Thank You to the families of PFC Blaine Adams, CPT Jay Brainard, and CPL Andrew Hutchins for sharing the story of your loved ones with us and allowing us to carry their stones and stories up Katahdin this weekend. Although we never knew these men, they have had a profound impact on each of us and will never be forgotten.